Photoxor C1 Version 1.4.5 is available now. Upgrade or download for free now from Google Play. 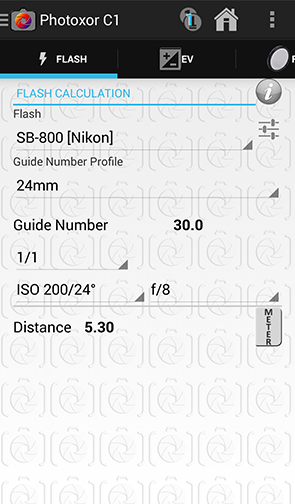 A new screen is now available to perform camera flash calculations. Within Setting you are able to define the characteristics of your own flashes. The free version supports the definition of one guide number. In case you have got a zoom flash you might want to consider the new Flash Pro add-on, which allows you to configure a more complex guide numbers profile. 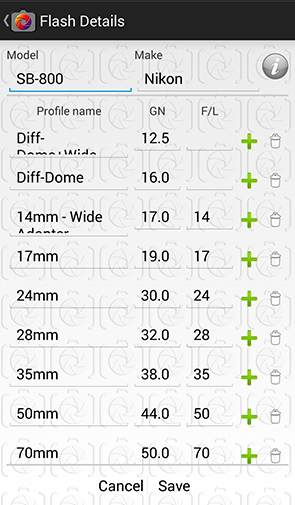 You are then able to define the guide numbers for different zoom settings and also for light modifiers (such as a diffusion dome). These definitions are also available in the free version!